If you're adding a Porkbun-registered domain to Google's G Suite, you'll want to update your domain's MX records to route mail to Google's mail servers. Only add these records if you want your users to receive mail for this domain in their Gmail inboxes. Locate the domain you wish to update. Click the drop-down list to the far right of the domain name. 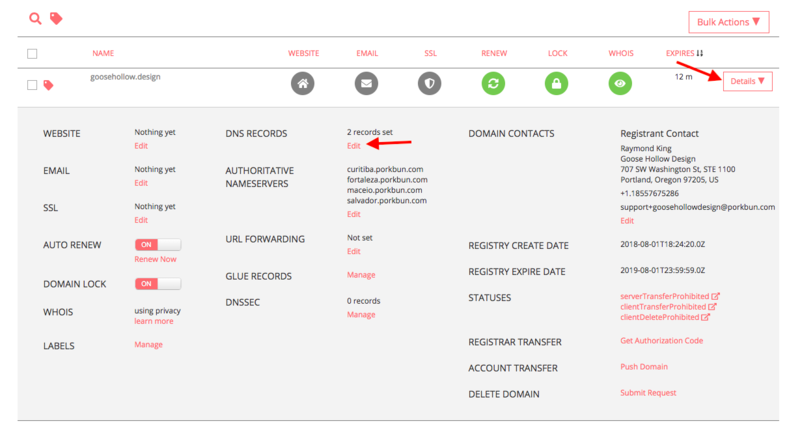 Then go to the section labeled "DNS Records" and select "Edit". 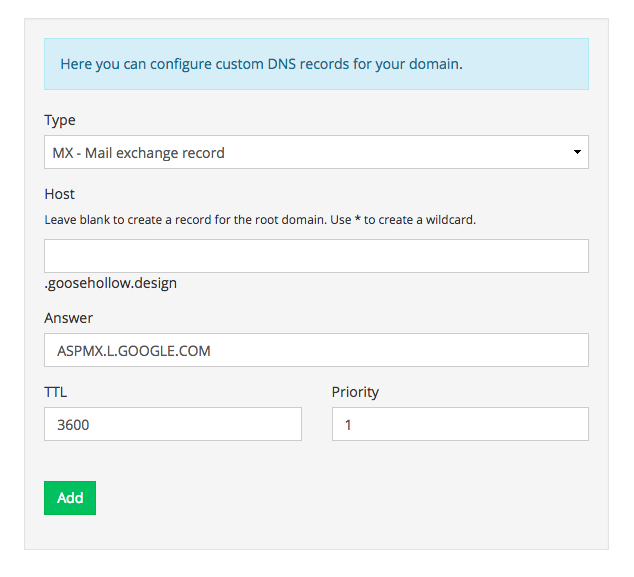 Scroll down to see your existing DNS records. If there are any existing MX records (look for "MX" in the leftmost column), delete all of them using the trash can icon. Open up the following Google support article in a new window or tab: "Configuring Your MX Records: Other domain hosts." Change the Type field to "MX - Mail exchange record". Under Answer, specify the entry from the "Mail Server" column in "Configuring Your MX Records: Other domain hosts." TTL should be changed to 3600 per Google's instructions. Priority should match the Priority column specified in "Configuring Your MX Records: Other domain hosts." Click "Add" to add an MX record. Repeat the above steps until you've added all five MX records specified by Google. Your MX records are now configured to point to Google. These changes may take up to 48 hours to fully propagate across the Internet, although in most cases the change should be immediate. To ensure smooth email delivery, there is one final step you should undertake: Add an SPF record. First, look for and remove any existing TXT records that contain the phrase "spf1"